Fig. 1-3-2-1 shows the number of persons newly received by public prosecutors offices for violations of the Income Tax Act (Act No. 33 of 1965), the Corporation Tax Act (Act No. 34 of 1965), the Inheritance Tax Act (Act No. 73 of 1950), the Consumption Tax Act (Act No. 108 of 1988), and the Local Tax Act (Act No. 226 of 1950) over the last 20 years. The number of persons received in 2009 was highest for Corporation Tax Act violations at 280 (up 74 from the previous year), followed by Consumption Tax Act violations at 54 (down six (id. )), Income Tax Act violations at 43 (down 30 (id. )), Local Tax Act violations at 26 (down 129 (id. )), and Inheritance Tax Act violations at six (down one (id.)). 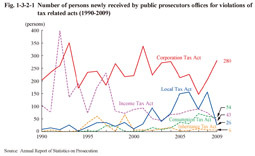 Table 1-3-2-2 shows the number of accused cases involving violations of tax related acts to public prosecutors by the National Tax Agency and the amount of tax evaded per case over the last five years. In FY 2009 the number of cases involving tax evasion amounts of 300 million yen or more was 17, of which six were for amounts of 500 million yen or more (Source: The National Tax Agency). 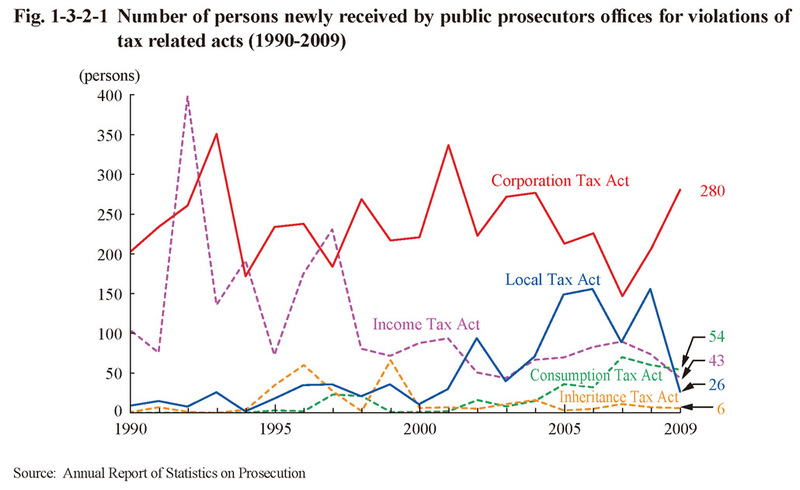 Examining the details of prosecutions in 2009 revealed that three persons prosecuted for Local Tax Act violations were put on the summary trial procedure and all the others were indicted (Source: Annual Report of Statistics on Prosecution). The number of persons finally disposed in a court of first instance (excluding transfers and others) for violations of tax related acts in 2009 was 34 (all of whom were sentenced to imprisonment with work for a definite term) for Income Tax Act violations, 145 (72 of whom were sentenced to imprisonment with work for a definite term and 73 to fine) for Corporation Tax Act violations, four (all of whom were sentenced to imprisonment with work for a definite term) for Inheritance Tax Act violations, 26 (14 of whom were sentenced to imprisonment with work for a definite term and 12 to fine) for Consumption Tax Act violations, and 13 (eight of whom were sentenced to imprisonment with work for a definite term and five to fine) for Local Tax Act violations (the number involving fine excludes those cumulatively imposed fine and imprisonment with work) (Source: Annual Report of Judicial Statistics and the General Secretariat, Supreme Court).